The Oklahoma DOT TAMP is available here. 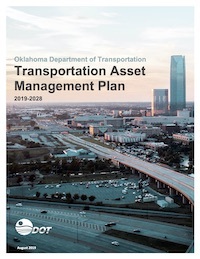 The Oklahoma DOT TAMP outlines a 10-year strategy for managing the state’s pavements and bridges. The strategy includes setting goals and objectives, reporting the current conditions of assets, and projecting conditions 10 years into the future. The TAMP also details life cycle planning, presents a financial plan, and discusses how to manage risk. Taken together, these elements give Oklahoma a path towards transparent and efficient use of taxpayer dollars. This document includes the following sections: Asset Valuation, Current Methods and Tools, Data Management, Financial Plan, Introduction, Inventory and Condition, Investment Strategies, Lifecycle Management, Objectives and Measures, Performance Assessment, Process Improvements, Regulatory and Legislative Requirements, Risk Management.